When you think of a cactus, you might picture a tall columnar form such as the saguaro. Alternatively, you might call to mind globular species like the barrel cactus or pincushion cactus or jointed species like cholla or prickly pears. The term "leaf cactus" refers to a range of less prototypical cacti that give the appearance of having leaves. Leaf cacti originate in warm, humid regions, and many grow epiphytically among the branches of trees. "Christmas cactus" refers to a wide range of related plants from tropical parts of South and Central America. The plants are also known as orchid cacti due to their combination of showy flowers and epiphytic growth habit. The stems are flat and leaf-like, and most species lack spines except as seedlings. In the wild, the plants bloom in spring, but manipulation of growing conditions can shift the blooming period to coincide with Thanksgiving, Christmas or Easter. Botanically, Christmas cacti belong to the genus Schlumbergera, which is synonymous with the older names Epiphyllum and Zygocactus. The flowers of naturally-occurring Schlumbergera species are white or red. Commercial growers have created a number of Schlumbergera hybrids with additional flower colors, most of which sell under the older genus name Epiphyllum. Many hybrids cross Schlumbergera with other tropical cacti, especially those with large, ornate flowers. These include the genuses Selenicereus ("queen of the night"), Nopalxochia and Heliocereus. According to the book "Cacti and Succulents," the term "leaf cactus" originally referred only to Schlumbergera hybrids, but the term now refers more widely to any cactus with a leafy look. Mistletoe cacti belong to the genus Rhipsalis, the only group of cactus that grows natively outside the Americas. LIke true mistletoe, Rhipsalis grows epiphytically and has glossy, pea-sized berries. The native habitat for Rhipsalis includes tropical areas of Central and South America, some parts of Africa, Madagascar and Sri Lanka. Many species of Rhipsalis have flat, leaf-like stems that are similar to those of Schlumbergera. 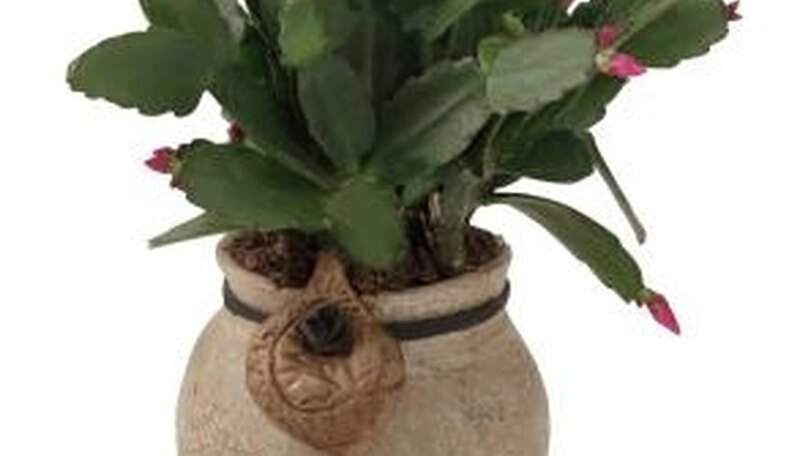 Other species are known as wickercare cacti and possess hanging tube-like stems that resemble thin vines. Cacti in the genus Hatiora grow natively in the rain forests of Brazil. [Ref. 3] Like Schlumbergera, they are also epiphytic. Stems of Hatiora grow in long, thin segments that hang and drape like vines. Each stem branches repeatedly, and the branches terminate with club-like thickenings that give the appearance of small leaves. Depending on the species, flower colors include yellow, orange, pink and violet. Individual blossoms are small and inconspicuous, but they can cover the entire plant. Tropical cacti in the genus Pereskia also go by the name "leaf cactus." Unlike Schlumbergera, the stems of Pereskia do not have a leaf-like appearance. Instead, Pereskia is one of the few cacti to possess true leaves. Another unusual characteristic is lack of a fleshy, water-storing stem. Pereskias have woody stems and grow as trees or shrubs. The plants still have spines, however. Pereskia species are native to Central and South America, as well as Florida and the West Indies. Other woody, leaf-bearing cacti include the genuses Peireskiopsis and Rhodocactus.